In the rear view mirror, 3Q GDP increased 2.5%. The primary difference from the last two poor quarters was that government consumption did not actually contract. In monthly reports, September's durable goods orders decreased but was considerably better than expected, as were "core capital goods" which have now, like real GDP, exceeded their pre-recession peak. Personal income just barely rose, but spending was up a strong 0.6%. New home sales also exceeded expectations, and the Case-Shiller report once again remained above its March lows With both residential and nonresidential investment actually making positive contributions to GDP last quarter, the quarterly, monthly, and weekly data (as discussed below) all suggestthat housing sales as well as prices may actually have put in their bottom. On the other hand, consumer confidence plummeted further to a low last seen during the worst part of the "great recession." The high frequency weekly indicators were generally good this week, with the singular and stunning exception of gasoline usage. Oil finished near $94 a barrel on Thursday. This is at its recession-trigger level. It is extremely concerning that just a few days of good economic news causes oil prices to rocket right back to their choke collar point. Gas at the pump declined $.02 to $3.46 a gallon. Measured this way, we probably are still about $.20 above the 2008 recession trigger level. Gasoline usage plummeted -9.2% YoY, at 8501 M gallons vs. 9358 M a year ago. This reading of gasoline usage has in recent years only occurred in the dead of winter, and is the biggest YoY% decrease in at least the last 4 years. This is an absolutely huge decline measured both ways. Bill McBride a/k/a Calculated Risk believes it may just be noise, but if so it is one helluva thunderclap. Bill suggests using a 4 or even 10 week moving average. Even so, another reading next week like the last two weeks (last week was similarly low, and dpwn -3.3% YoY) would give us a strong warning on a 4 week basis. This week may be telling us that consumers have permanently altered their gasoline usage habits towards more conservation. All three jobs-related indicators improved in the last week. The BLS reported that Initial jobless claims fell 1,000 to 402,000. The four week average increased to 405,500. With the exception of 8 weeks at the beginning of spring, the four week average remains close to its best reading in over 3 years. The American Staffing Association Index rose to 91 last week. In the last couple of months, this series has resumed its upward trajectory, but remains lower YoY. Tax withholding also improved. Adjusting +1.07% due to the 2011 tax compromise, the Daily Treasury Statement showed that for the first 17 days of October, $117.5 B was collected vs. $115.3 a year ago. For the last 20 days, $134.2 B was collected vs. $126.8 B a year ago. This breaks the string of actual negative readings from the last month. Housing had a another reasonably good week. The Mortgage Bankers' Association reported that seasonally adjusted purchase mortgage applications decreased 6.4% last week. On a YoY basis, purchase applications were down -2.7%. This is back in the range that purchases mortgage applications have had been in for the 15 months beofre September. Refinancing increased 4.4% w/w. Refinancing has been very volatile and affected by small changes in interest rates. Meanwhile, YoY weekly median asking house prices from 54 metropolitan areas at Housing Tracker showed that the asking prices declined only -0.7% YoY. Like almost every single week for the last couple of months, this is yet another record smallest YoY decline in the 5 1/2 year history of this series. The areas with YoY% increases in price increased by one to 17. The areas with double-digit YoY% declines remained at only 2. Nationwide asking prices may turn YoY positive within the next month. Turning to money supply, M1 declined -0.3% for the week. It remains up 2.0% m/m, and 20.7% YoY, so Real M1 was up 16.8%. M2 rose 0.1% w/w. 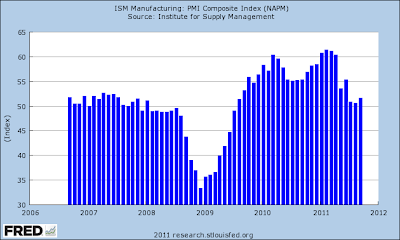 It remained up 0.6% m/m, and 10.3% YoY, so Real M2 was up 6.4%. The YoY increase in both M1 and M2 nevertheless continue near historic high levels. It will be interesting to see what happens to these two series in the next several weeks, as a gauge of confidence as to whether the Euro situation is truly on its way to being solved. Retail same store sales were tepidly positive. The ICSC reported that same store sales for the week of October 22 increased 2.4% YoY, while decreasing -0.8% week over week. Shoppertrak reported that YoY sales rose 2.7% YoY and were down -1.5% week over week. Weekly BAA commercial bond rates decreased .11% to 5.41%. Yields on 10 year treasury bonds also decreased .02% to 2.20%. This is the third week in a row of decreasing spreads between the two rates, a good sign. The American Association of Railroads reported that total carloads increased 1.5% YoY, up about 8300 carloads YoY to 547,300. Intermodal traffic (a proxy for imports and exports) was up 9800 carloads, or 4.2% YoY. The remaining baseline plus cyclical traffic declined 1500 carloads or -0.6% YoY. Total rail traffic has improved in the last month after having turned negative for 6 of 12 weeks during the summer. With the exception of gasoline usage, this was probably the best week for the high frequency indicators in over 3 months. Unfortunately, if the positive economic news continues, I expect that Oil choke collar to be applied again almost immediately. It took months of fighting — the threat of a government shutdown, the graver threat of a default on the national debt, and now a new threat of major, automatic cuts to Medicare and defense programs — but Congress’ deficit obsession has finally exposed the rarest of all species: Republican Keynesians.With just a under a month until the deficit Super Committee must recommend policies that cut the 10 year deficit by $1.2 trillion, members of the Republican party — the same party that’s been on the war path for deep spending cuts, and that decries President Obama’s “failed stimulus” — are making uncharacteristic arguments against slashing spending. Trim too much, too quickly, they warn, and people will lose their jobs! Call them Defense Keynesians — GOP members who represent defense interests, veterans, service members, contractors, and others whose livelihoods would be impacted by deep cuts to defense spending. They don’t want the Super Committee to cut much more, if any, from defense, and they certainly don’t want to pull the so-called “trigger” which would cut defense across the board by about $600 billion starting in 2013, if the panel gridlocks. “Yes, that’s right, Senator,” Elmendorf responded. Real gross domestic product -- the output of goods and services produced by labor and property located in the United States -- increased at an annual rate of 2.5 percent in the third quarter of 2011 (that is, from the second quarter to the third quarter) according to the "advance" estimate released by the Bureau of Economic Analysis. In the second quarter, real GDP increased 1.3 percent. I just wanted to take a quick look at Q3 2011 GDP, which I think is actually a bit better (the internals) than what the headline shows. The advance headline of up 2.5% was in line with expectations and is generally speaking a less than stellar number, but the breakdown may be a bit more promising. First, consumer spending is back, increasing 2.4%, But the best part of the number was the 4.1% increase in durable goods purchases. This tells us that -- despite low morale -- consumers are buying bigger ticket items. Service purchases -- which have been a big reason for the continued increase in PCEs -- also increased at a 3% clip. Non-residential investment increased at a 16.3% clip -- a very healthy pace. Equipment and software expenditures increased 17.4% -- indicating that businesses are more than willing to invest in their own infrastructure. And non-residential structural investment increased at a 13.3% rate -- another strong improvement. Exports -- which have been a driver of the expansion, increased at a 4% rate while imports increased at a 1.9% rate. As NDD pointed out, had it not been for a contraction in private inventories, the overall growth rate would have been over 3% (inventory adjustments subtracted a little over 1% from the overall growth rate). I'll be looking at this data in more detail all next week, but for now, the number and the internals are pretty encouraging. Over the last few weeks, I've been hesitant about the risk on trade. No more. Yesterday we say a strong break-out in equities in conjunction with a sell-off in the Treasury markets -- where we finally saw some volume increases on the sell-off. The reasons for this rally were: the EU coming to some type of agreement and the US printing a decent GDP number. The DIAs -- which are already above the 200 day EMA, gapped higher. The 10 day EMA has crossed the 200 day EMA and the 20 is about to follow suit. The SPYs also gapped higher yesterday. The shorter EMAs are bullishly aligned and we had a bump up in volume as well. The IWMs have more of a ways to go. While prices are now over the 200 day EMA, the shorter EMAs have yet to cross. Given recent price action, they probably will in the near future, but we're not there yet. However, note the nice volume bump yesterday. both the 7-10 year and 20 year plus treasury market finally moved lower on a nice volume bump. Short version: equities are rising and the sell-off in the Treasury market is gaining steam. Nothing of a surprise here; real estate is still in terrible shape. The good news is that it can't fall much further, which, in my opinion, seriously prevents another serious economic contraction. All of the charts below are from the website Calculated Risk. 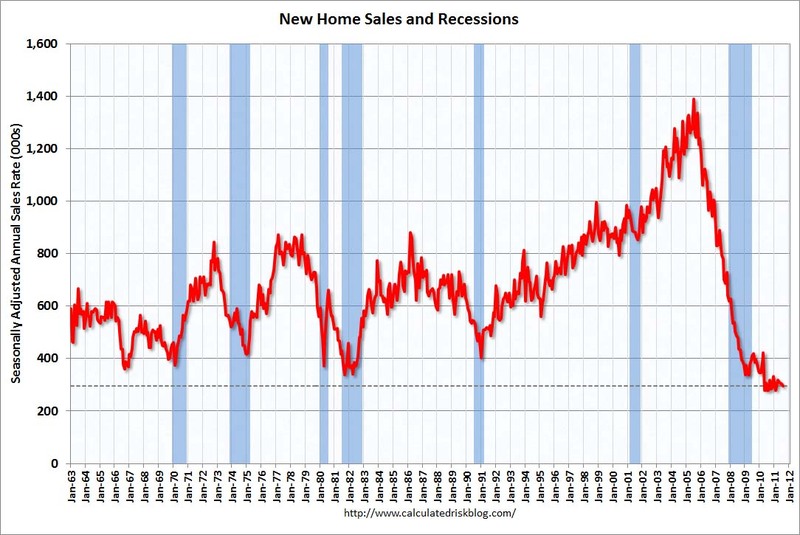 The overall pace of new home sales is still near multi-decade lows. 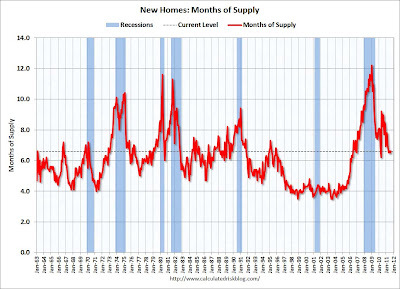 However, the months of available supply appears to be in line with historical norms. 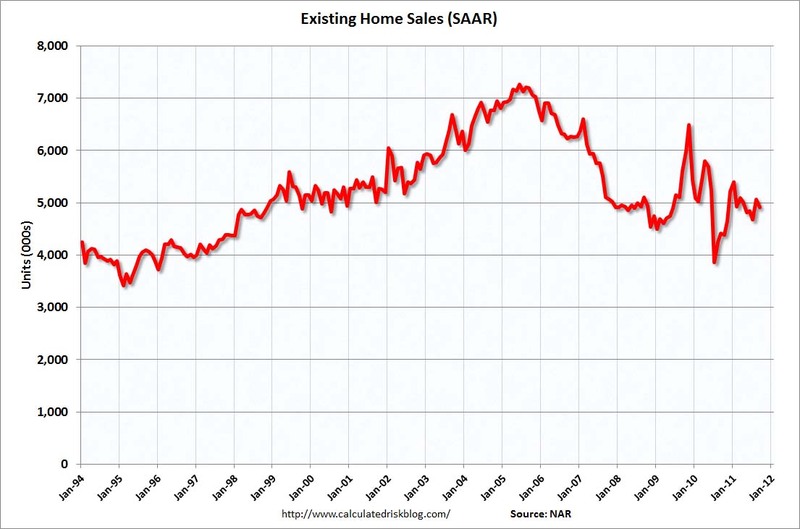 The pace of existing home sales is still centered around the 5 million/year figrure, where, despite the distortions caused by the housing credit issue, it's been for the last years. 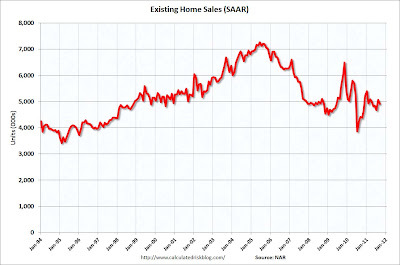 The number of existing homes on the market is still elevated, but it has been slowly moving lower over the past few years. Real estate is still in a terrible place. However, it can't get much worse, which is actually good news. European leaders, in a significant step toward resolving the euro zone financial crisis, early Thursday morning obtained an agreement from banks to take a 50 percent loss on the face value of their Greek debt. The leaders agreed on Wednesday on a plan to force the Continent’s banks to raise new capital to insulate them from potential sovereign debt defaults. But there was little detail on how the Europeans would enlarge their bailout fund to achieve their goal of $1.4 trillion to better protect Italy and Spain. 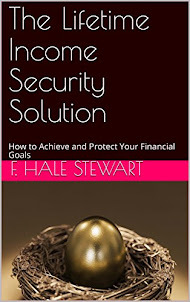 In what the leaders saw as an important first step, banks would be required under the recapitalization plan to raise $147 billion by the end of June — enough to increase their holdings of safe assets to 9 percent of their total capital. That percentage is regarded as crucial to assure investors of the banks’ financial health, given their large portfolios of sovereign debt. The overall euro deal under discussion is complicated, weaving together the efforts to restructure Greek debt, increase the capital of Europe’s banks and expand the bailout fund so that it can ward off a financial panic in Italy — the euro zone’s third-largest economy — as well as in the relatively small economies of Greece and Portugal. Attention has focused on Italy because its government seems incapable of responding to the crisis, which has undermined the markets’ faith in Europe’s capacity to solve its problems. First, private inventories subtracted a full 1.08 percent from the total (ie with inventory levels unchanged, we would have seen a 3.5% print on headline GDP). 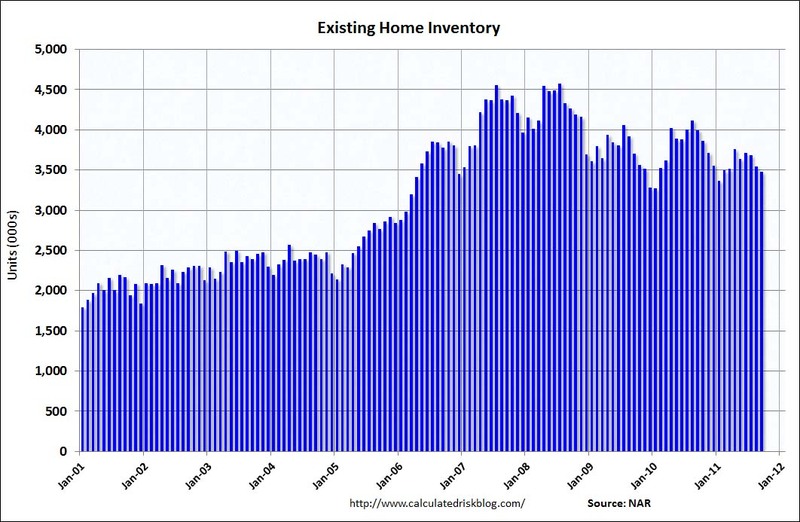 This decline in inventories is unlikely to persist (provided we stay out of recession) into the next few quarters. Second, the numbers for private investment are starting to heat up. Fixed private investment added 1.6 points to GDP and the change from the preceding quarter was up 13% for structures and 17% for equipment and software from Q2 (which was also positive). So while we may not be seeing job creation, it is hard to say that businesses are tentative about making investments now. Third, while I doubt that government is going to be adding much to GDP in the near future, we may be seeing the losses slow somewhat (a breakeven for this Q in total and only down .16 for state and local). Finally, after being a huge drag for what seems like ever, it looks as though residential investment as a component of GDP has finally bottomed, which should further stop the bleeding. Now all we need is for some of that increased private investment to start leading to greater job creation numbers. The SPYs rally continues. Notice there are now two price clusters (see arrows) where -- after rising -- prices have consolidated their gains using the 110 day EMA as technical support. The EMA picture continues to be positive and the last two days have seen a small bump in volume. 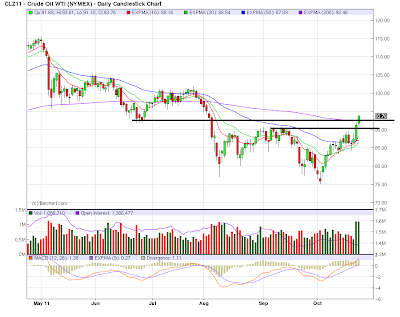 UPside resistance is a it below 126 while support is coming from the 200 and 10 day EMA. Interestingly enough, the IEFs have not fallen from their center of gravity at the 50 day EMA. Instead, prices and the EMAs have formed a "barbed wire" situation where the candles and prices are caught in an inter-twining situation. Support is right around the 125.25 area -- a move below there in combination with a move higher in equities would confirm the equity's rally. Corn is still in a fairly wide trading range/consolidation pattern between 600 and 800. What's interesting to note is that while other commodities took a big hit during the risk off trade of the last few months, corn didn't move lower, indicating there is still a very tight supply and demand issue. In contract, soy beans -- which were in a trading range between 1250 and 1450 -- recently fell below that range with 1250 not becoming resistance for this market. The latest lending survey from the Fed was released in July, so it's a bit out of date with the above data. 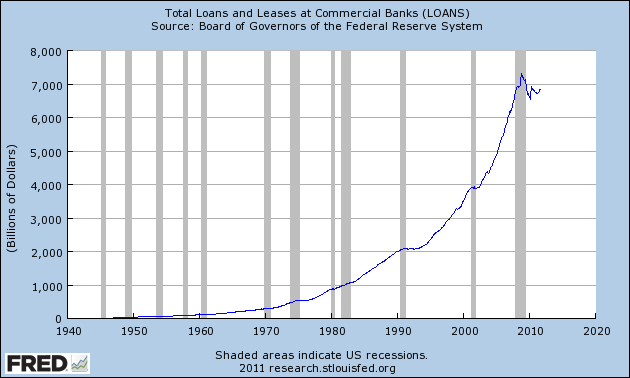 Total loans and leases has been floundering for the duration of the latest expansion, indicating that credit expansion is not taking place in any meaningful way. 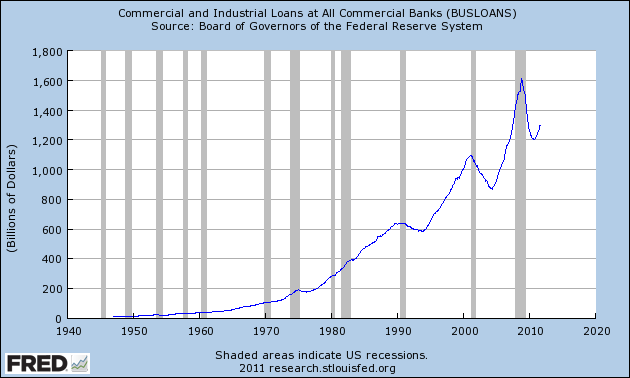 Commercial and industrial loans are not to blame, as this category has turned around from its drop. Ignore the bump at the beginning of the expansion which is a technical bounce. Consumer lending is still weak. Total real estate lending is dropping as well. The above data indicate that credit expansion is weak at best, telling us the economy is definitely in a liquidity trap. Yesterday the Conference Board reported the lowest level of consumer confidence since March 2009. Note the sharp loss of confidence at the time of the autumn 2008 financial collapse, and the even more sudden increase in early 2009. Specifically, sentiment sprang off its bottom at the same time as the stock market did, in the first week of March 2009 (just after the passage of Obama's stimulus package), rising sharply into May 2009. Sentiment stayed roughly even until the July debt debacle, when it collapsed right back down to its 2008 lows. Since that time it has bounced a little off the bottom, but is nowhere near to its pre-July levels. This is an anomalous finding, seemingly a far more profound loss than the recent raw economic data justifies. Indeed, it appears to represent a Loss of Hope in the current political and economic status quo. If there is any silver lining, it is that this loss may be what finally galvanized the collective action of the Occupy Wall Street movement, which by the way I thoroughly support. Yesterday, we say the equity markets retreat a bit. The 5-minute charts shows prices retreating to the technically important level of 123, while the daily chart shows prices pulling back to just below the 200 day EMA. This is a standard sell-off situation and should not be interpreted as a break in the upward trend yet. Instead, we see traders taking some profits off the table as they wait to see how the upcoming news shakes out. At the same time, we see Treasury prices rallying strongly, printing a large bar, but on very weak volume. Prices closed right above the 10 day EMA. Again, this is not a trend reversal -- at least not yet, but instead a 1-day reaction to the equity sell-off. The low volume indicates a lack of conviction on the part of traders to move into the treasury market in a big way. After a late spring, early summer sell-off, cattle is nearing yearly highs again, largely because thin herds are lowering the number of cattle going to market. This will lead to further upward pressure on food prices -- which are already moving higher at uncomfortable levels. However, we may see a switch to pork, as prices there gapped lower severl times over the last two months. Can aging population explain income stagnation? If regulation was a significant drag on business today, we would expect to see profits constrained after recent regulatory reforms were passed into law. However, corporate profits as a share of gross domestic income have about recovered their pre-recession peak, and earnings per share in industries most affected by recent regulatory changes, such as energy and health care, have among the highest earnings per share of those in the S&P 500. 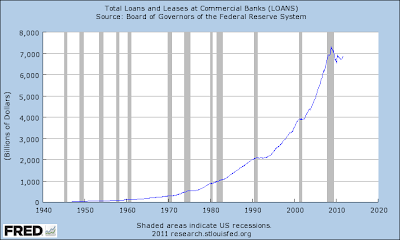 This growth is inconsistent with a corporate sector held back by regulation. If regulatory uncertainty was the primary problem facing businesses, firms would prefer to use their existing capacity and current workers as much as possible, while avoiding building additional capacity until they are more certain about the contours of future regulation. Specifically, if demand was strong but businesses were concerned about future regulations, they would increase the hours of the workers they already employ rather than hiring additional workers. We have seen no evidence of this in the data: the average work week for private employees has been roughly flat for the past year. Similarly, if demand were strong, firms could easily expand using existing capacity without taking on the cost and risk of added capacity. However, the share of total potential industrial output in use remains 3 percent below its long-run average. Low capacity utilization is inconsistent with concerns about future regulatory risk, but aligns with weak demand holding back current production. In the September survey of small business owners by the National Federation of Independent Businesses, more than twice as many respondents cited poor sales (29.6 percent) as their largest problem than cite regulation (13.9 percent). In an August survey of economists by the National Association for Business Economics, 80 percent of respondents described the current regulatory environment as “good” for American businesses and the overall economy. As noted above, in a recent Wall Street Journal survey of economists, 65 percent of respondents concluded that a lack demand, not government policy, was the main impediment to increased hiring. According to data from the Bureau of Labor Statistics, less than three-tenths of 1 percent of mass lay-offs in the second quarter of this year were due to government regulations or intervention. Like the manufacturing report, this seems to be a "two steps forward, one step back" summation. Growth appeared to be reported in a small majority of districts, but the negative news weighed down the positive advances. "The NMI registered 53 percent in September, 0.3 percentage point lower than the 53.3 percent registered in August, and indicating continued growth at a slightly slower rate in the non-manufacturing sector. The Non-Manufacturing Business Activity Index increased 1.5 percentage points to 57.1 percent, reflecting growth for the 26th consecutive month. 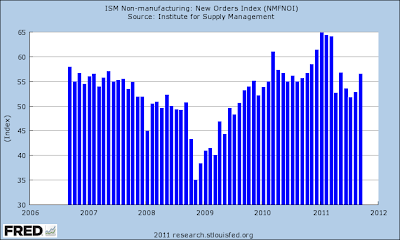 The New Orders Index increased by 3.7 percentage points to 56.5 percent. The Employment Index decreased 2.9 percentage points to 48.7 percent, indicating contraction in employment after 12 consecutive months of growth. The Prices Index decreased 2.3 percentage points to 61.9 percent, indicating prices increased at a slower rate in September when compared to August. According to the NMI, nine non-manufacturing industries reported growth in September. Respondents' comments reflect an uncertainty about future business conditions and the direction of the economy." Overall, the area is still just above the 50 line between growth and contraction. New orders are up, but employment is down. The overall tone of the anecdotal information from the report is one of a weakening outlook. Lack of confidence on the part of both consumers and business is lowering current and future sentiment. No one has any faith that things are going to get better in the near future. The composite index has been hovering above 50 for the last 6 months, indicating this area of the economy is still expanding. 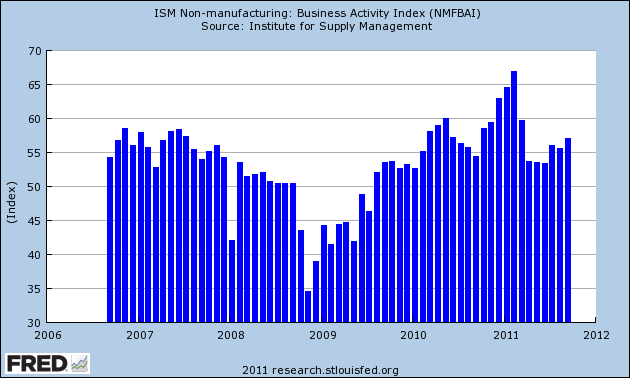 The business activity index is still above 50, and has risen a bit over the last three months. New orders were fluctuating over 50 for the last three months, but last month they took a solid pop higher. 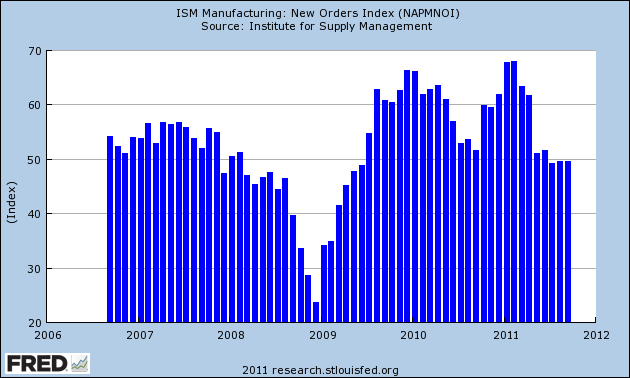 However, new orders did the same thing a few months back, only to fall back to lower levels. The employment index has been dropping for the last three months and last month moved below 50 -- a sign of contraction. The service sector appears to be in a slowdown phase, largely caused by lowered confidence and lack of economic visibility. The above 10-day, 5 minute chart shows prices consolidating between 119 and 123; followed by their break-out on Friday and their continued move higher yesterday. Also note how the range high of 123 became support for the break-out. While prices have continued their break-out, I am still concerned about the lack of volume. While no rally is ideal -- that is, it does not have all the expected hallmarks of an upward move -- the lack of volume is concerning. Ideally, we'd like to see prices advance, fall back to technical support (the 200 day EMA) and then continue their move higher. Both the medium and longer term Treasury markets are hanging on to the respective "center of gravity." We're also not seeing a massive sell-off on higher volume totals. The above charts show that the overall risk on trade is "on." 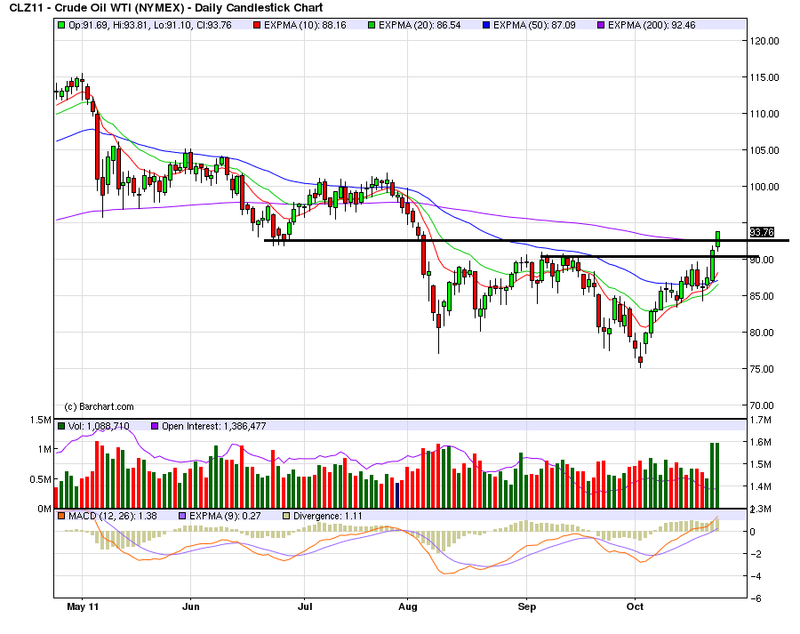 Oil has also moved through important technical resistance areas around the 90 and 93 handle. Also note the shorter EMAs are moving higher, with the 10 having crossed the 50 day EMA and the 20 about to do so. Day before yesterday oil printed a very strong bar, followed by yesterday's move higher -- which moved prices through the 200 day EMA. The dollar's recent fall does not help matters, but this move higher is also part of the overall "risk on" trade. This sort of a program is in many ways vastly superior to the spending increases and tax cuts we saw in the American Recovery and Reinvestment Act of 2009. The limitation of most of the spending increases and tax cuts in the last rescue plan was that they were merely temporary fixes; they had no long-lasting effects. As long as the money flowed, they were stimulative; once the spending stopped, the stimulus stopped as well. We still enjoy the benefits of the interstate highway system, which allows goods to be moved cheaply around the nation. Innovations at NASA led to many new products and industries, including innovations in the semiconductor, satellite and mobile computing sectors. And DARPAnet? You might recognize that as today’s Internet. All three are massive economic wealth generators, filling a role that is too long term and too expensive for the private sector. Contacts indicated that manufacturing and transportation activity increased since the last report in most Districts. A large number of Districts reported higher production of autos and other transportation-related equipment. Cleveland, Atlanta, and Chicago noted increases in auto production, and Boston, Richmond, Chicago, and St. Louis all cited robust activity for auto suppliers. Dallas reported healthy demand for nondefense transportation goods. Boston, Richmond, Kansas City, and San Francisco indicated continued growth in commercial aviation and aerospace manufacturing. Steel production rose in Cleveland and Chicago, and in a number of Districts metal manufacturers' new orders also rose. Other areas of manufacturing were more mixed. The Dallas report noted a decline in refining activity. However, both Dallas and Atlanta continued to note robust oil and gas drilling activity, and this activity was said to be propelling demand for related equipment from suppliers in Chicago. Manufacturing of construction materials or equipment was reported to have increased some in Philadelphia, Chicago, and Dallas but remained weak in most other Districts. Growth in high-tech manufacturing continued to be robust in Boston, but moderated in Dallas and San Francisco. Respondents reported that food production was up in Chicago, Minneapolis, and San Francisco, steady in Dallas, and lower in Boston. Manufacturers of consumer products reported a softening in orders in Richmond, Chicago, and Dallas, while new orders for apparel increased in San Francisco. The overall environment appears to be slightly positive. Heavier goods -- autos, transportation, commercial aviation, steel and metals all rose, while construction equipment and consumer products were weaker. "The PMI registered 51.6 percent, an increase of 1 percentage point from August, indicating expansion in the manufacturing sector for the 26th consecutive month, at a slightly higher rate. The Production Index registered 51.2 percent, indicating a return to growth after contracting in August for the first time since May of 2009. 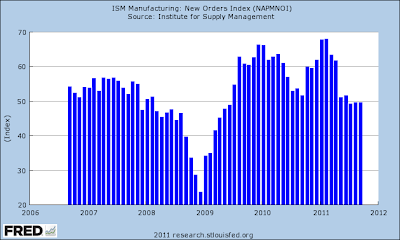 The New Orders Index remained unchanged from August at 49.6 percent, indicating contraction for the third consecutive month. The Backlog of Orders Index decreased 4.5 percentage points to 41.5 percent, contracting for the fourth consecutive month and reaching its lowest level since April 2009, when it registered 40.5 percent. Comments from respondents generally reflect concern over the sluggish economy, political and policy uncertainty in Washington, and forecasts of ongoing high unemployment that will continue to put pressure on demand for manufactured products." The overall composite index shows a drop in activity over the last 5 months. But, note that overall activity has remained slightly positive. 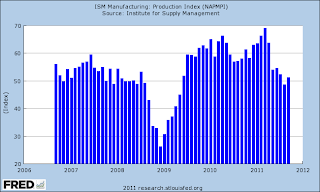 The production index turned slightly positive. The overall tone of the comments is quite mixed. 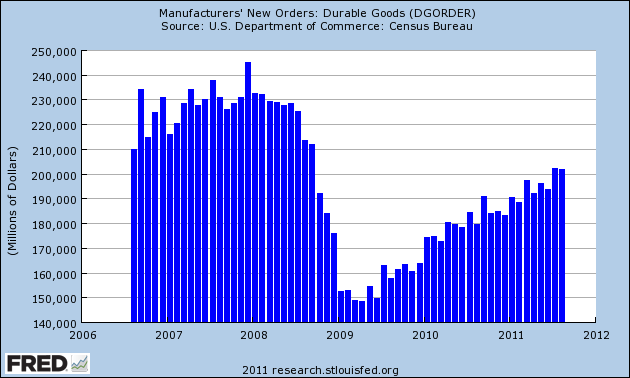 Durable goods new orders continue to move higher, but they are still below the highs established in the previous expansion. Over the last few months, I've expressed concern about this number, largely because of the stalling that occurred 6 months ago. While that stalling is now over, I would still like to see more strength in this numbers series. This index has been right below 0 for the last three months, indicating slight contraction. The good news is that it hasn't contracted any more sharply, but the bad news is it's still negative. The survey’s broadest measure of manufacturing conditions, the diffusion index of current activity, increased from -17.5 in September to 8.7, the first positive reading in three months (see Chart). The current new orders index paralleled the rise in the general activity index, increasing 19 points and returning to positive territory. The shipments index also recorded a positive reading, increasing from -22.8 in September to 13.6 this month.Labor market conditions improved only slightly this month. Nearly 18 percent of the firms reported an increase in employment, but 17 percent reported a decrease. The current employment index remained slightly positive but decreased 4 points from its reading in September. The average workweek index increased notably from -13.7 to 3.1. However, the percentage of firms reporting a longer workweek (15 percent) was only slightly greater than the percentage reporting a shorter one (12 percent). This number had a nice pop the last month, pulling it into decently positive territory. In September, the seasonally adjusted composite index of manufacturing activity — our broadest measure of manufacturing — increased four points to −6 from August's reading of −10. 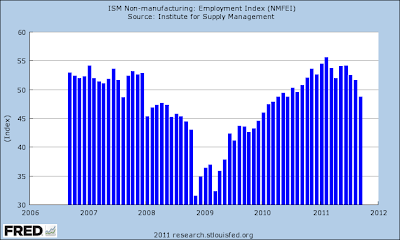 Among the index's components, shipments gained fifteen points to −2, new orders dropped six points to finish at −17, and the jobs index moved up six points to 7. These results are very similar to those for the Empire State survey; they are weaker, but slightly so. concentrated in durable goods plants, particularly for aircraft and computer equipment, while nondurable goods producers reported a continuedslowing in activity. Most other month-over-month indexes also improved modestly in September. 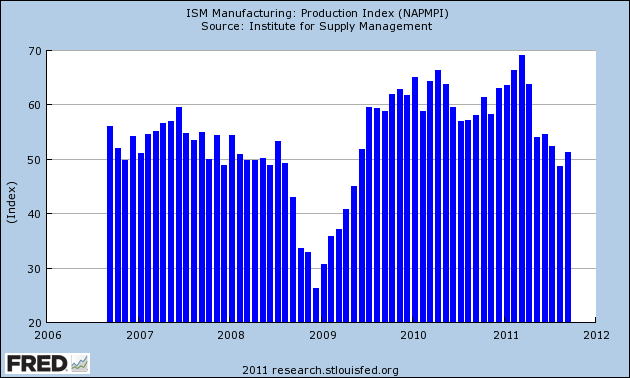 The production index rose from -2 to 3, and the shipments, new orders, and order backlog indexes also edged up. The employment index increased for the second straight month, but the new orders for exports index fell slightly after rising last month. Both inventory indexes increased somewhat. These were slightly positive, but just barely so. The Chicago Fed Midwest Manufacturing Index (CFMMI) increased 0.6% in August, to a seasonally adjusted level of 85.0 (2007 = 100). Revised data show the index increased 0.3% in July. Again -- just a bare increase. Texas factory activity increased in September, according to business executives responding to the Texas Manufacturing Outlook Survey. The production index, a key measure of state manufacturing conditions, rose from 1.1 to 5.9, suggesting growth picked up this month after stalling in August. Most other measures of current manufacturing conditions also indicated growth in September. The new orders index edged down from 4.8 to 3.6 this month, suggesting order volumes continued to increase, but at a slightly decelerated pace. 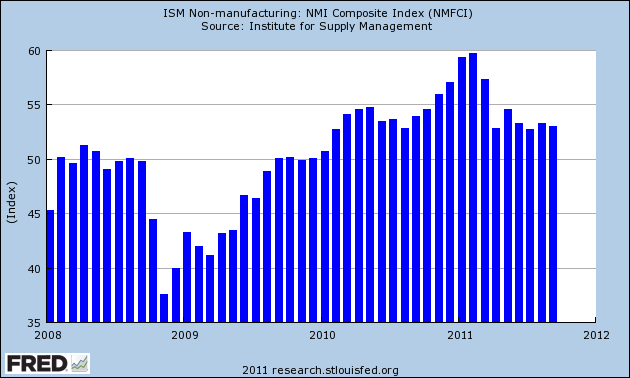 The shipments index rose from 6.7 to 9.4, reaching its highest level since March. The capacity utilization index remained in negative territory in September but rose from –2.8 to –1.3. Perceptions of general business conditions worsened in September. The general business activity index remained negative for the fifth month in a row and fell from –11.4 to –14.4; 10 percent of manufacturers perceived an increase in activity this month, while one quarter noted a decrease. The company outlook index fell from 7.2 in August to a near-zero reading in September. Still, the great majority of respondents said their outlooks were unchanged or improved from last month. The overall tenor of the manufacturing sector is one of slight strength or slight weakness, but essentially one where overall activity is fluctuating right around the "0" line. Equities: The SPYs and DIAs have broken out. The QQQs are in a downward sloping pennant pattern and the IWMs are on the verge. Dollar: the dollar continues its sell-off. Remember, the dollar has become a risk trade proxy; when people seek more risk, they sell the dollar and when they seek less risk, they buy. The DIAs and SPYs have broken through the 200 day EMA. The DIAs had a decent volume surge, while the SPYs had a bit. They have also moved above important areas of resistance. With both averages the 10 and 20 day EMA are moving higher, with the 10 having moved through the 50 and the 20 on the verge. Prices had a nice period of consolidation right below the 200 day EMA to allow traders to "catch their breath." The QQQs are a bit further along. Prices have been above the 200 day EMA for a little over a week, and all the EMAs have already crossed over. Prices have formed a downward sloping pennant pattern, which is a standard consolidation pattern in a rally. All the EMAs are also moving higher. One of my central criteria for determining if this rally was for real was the technical resistance of the 200 EMA. Now three averages are above this important bull/bear market line, which is very important. The 7-10 year treasury ETF is still using the 50 day EMA as a "center of gravity." However, note the shorter EMAs are both moving lower with the 10 day EMA about to cross below the 200. However, the TLTs have moved below their consolidation range and are using the 50 day EMA as technical support. The dollar is selling off. Prices -- which consolidated below the 200 day EMA -- have now continued to more lower. The 10 and 20 day EMA have both crossed below the 200 day EMA, and the 50 day EMA never made it above it. In addition, we've seen a pick-up in volume. As mentioned above, the markets are clearly in a "risk on" trade position right now. The most important technical development we could see right now is a strong move lower in the Treasury market on strong volume; this would indicate there is a move out of the safe assets.